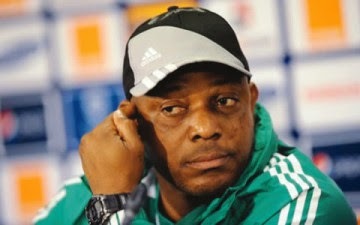 Super Eagles’ Head Coach Stephen Keshi on Wednesday in Uyo shunned the mandatory post-match briefing after his team drew 2-2 with visiting South Africa at the Ibom International Stadium. No reason was given for his attitude by Nigeria Football Federation (NFF) officials, following the Final Qualifying Group A Matchday Six tie for the 2015 Africa Cup of Nations (AFCON). However, his South African counterpart, Ephraim Mashaba, spoke to newsmen, saying his boys played very well. We only lost the game in the last five minutes played. We would have scored a third goal, but we were disorganised by the red card. "We did well because we fielded young players five of who play in the Under-17 and Under-20 national teams,’’ he said. The coach said his team would be hoping to go beyond the first round at the finals in Equatorial Guinea next January. "We hope to reach the finals in Equatorial Guinea. After all, we have played with strong teams - Sudan, Congo and Nigeria in the qualifiers,’’ he said. Mashaba however refused to talk about the Eagles. Also, Fanny Amun, a former national under-17 team coach, said that what happened called for a stakeholders meeting. He said the NFF should go back to the drawing board. "I do not want to lay blames on anybody, but we should sit down and analyse what has gone wrong and what should be put right,’’ Amun said.